In 2021 Rotary in Australia, New Zealand and the Pacific will be 100 years old following the establishment in 1921 of Rotary Clubs in Melbourne, Sydney, Auckland and Wellington. The Rotary: Give Every Child A Future project will celebrate 100 years of achievement and demonstrate that Rotary is alive and well, and continuing to do great things in the communities in which it operates. 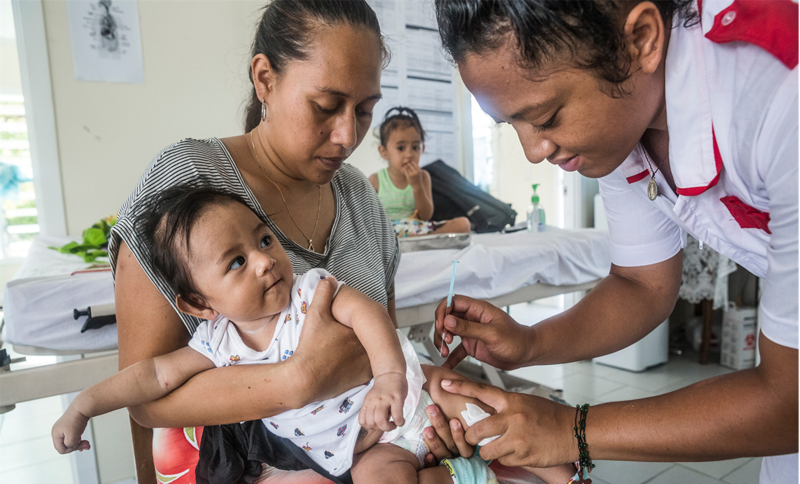 This visionary partnership between Rotary and UNICEF will support the introduction of three vaccinations to save the lives of generations of children across the Pacific by preventing a range of deadly diseases. Issue: Despite progress, globally every 20 seconds a child still dies from a vaccine preventable disease. In the Pacific diarrhoea and pneumonia are among the leading killers of children under five contributing to shockingly high mortality rates. For example, in Kiribati a child is 14 times more likely to die than a child in Australia or New Zealand. Additionally, 85 per cent of new cases of cervical cancer and deaths from the disease occur in less developed countries like in the Pacific where a lack of regular screenings makes girls more vulnerable. Vaccinations are therefore critical in preventing disease and reducing mortality rates. As the introduction of vaccines is a critical but complex undertaking, this program will deliver a comprehensive package of support and coordinated actions working with government partners across nine Pacific Island countries (PICs) including the Cook Islands, Kiribati, Nauru, Niue, Samoa, Tokelau, Tonga, Tuvalu and Vanuatu over three to four years. Given UNICEF’s way of working with governments, partners and communities, the program will build a sustainable immunisation program that will continue to save the lives of generations of children. Therefore Rotary’s impact will be felt long after the three-year life of this project. Additionally, Rotary will be strategically co-funding certain project components with the Asian Development Bank (ADB). This means instead of introducing each vaccine separately, UNICEF can introduce three new vaccinations at once. Not only will this benefit more children, it will also deliver significant cost efficiencies as we leverage economies of scale and reduce the overlap of support services (e.g. cold chain provision, supply chain, training and community awareness activities). The project builds on the existing partnership between Rotary and UNICEF, most notably in the very successful PolioPlus campaign, which has led to the 99.9% eradication of polio globally. Rotary and UNICEF have also worked together on a range of other successful projects around the world. This program also aligns to a number of Rotary’s key goals and objectives, including our focus on disease prevention and treatment, as well as maternal and child health. Together with UNICEF, we will raise the profile of Rotary’s support to children, communities and governments. We will also focus attention on our 2021 centenary, not only in Asia Pacific but globally, as we embark on this historic partnership. Promote the project within your network of friends, colleagues and acquaintances. Encourage them to use social media (Facebook, LinkedIn, Twitter, etc.) to talk about the project and send everyone to everychildafuture.com where they can find more information and donate. Become an ambassador for the project. Be prepared to talk about its goals at a Rotary club or other meeting. For more information and the materials you need to make a presentation please contact rotary@everychildafture.com. Original generation time 2.0194 seconds. Cache Loaded in: 0.0006 seconds.